Yellow cake with chocolate frosting. Classic. 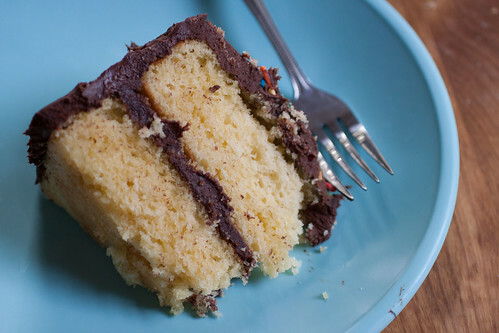 If you ask most people what their favorite cake is, they will answer, “Yellow cake with chocolate frosting.” It’s the cake of our fondest nostalgic imaginings, bringing to mind the best birthdays of childhood. Not my birthdays, though. I was a child of the 70’s with more imagination than sense, which means my earliest birthday cakes were carrot cakes (of course!) and then, when I was old enough to ask, I’d beg my mother to make a somewhat horrifying concoction of angels food, devils food, chocolate mousse and 7 minute frosting). Now that I am an actual grown up (I can no longer deny this fact due to thenature of 1) my tax return, 2) my grocery list, and 3) my color-coded online family calendar) I have a greater appreciation for classics. Things that never go out of style.ellow cake. Chocolate Frosting. 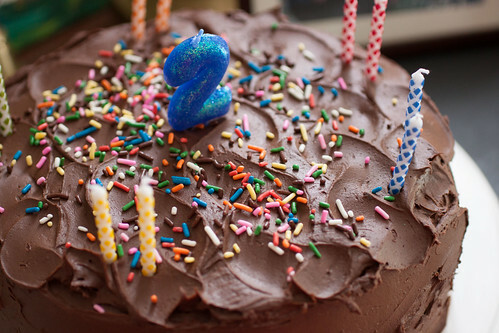 Last week, my baby turned two. Which means he is hardly my baby anymore. He no longer stays where I put him – instead he is constantly climbing and getting into everything. A few days ago, he went into the kitchen and poured himself a bowl of cereal. With milk. Which was pretty impressive if I ignored the milk all over the table. On the other hand, he is an extraordinarily charming two year old – head of blond curls, little voice that repeats everything, and lots of silliness. I wanted to celebrate his birthday with style, with class – and how better than with the classic – yellow cake with chocolate frosting? I’ve been wanting to share this cake with you for a while – it’s what cake is supposed to be – moist and light and rich at the same time, with a perfectly tender crumb. This is the cake that the boxed cake mixes are trying to emulate. The buttermilk keeps it tender and moist while the cake flour makes it light (you can use regular flour, and I have – it’s just not QUITE as good). The frosting is new to me, though, and it is GOOD. Not too sweet, and a little tangy from the sour cream – not quite as too much as a ganache but not as sweet and greasy as a true buttercream. 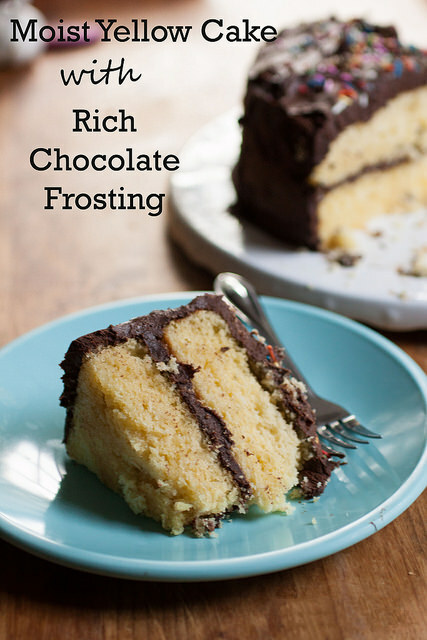 It spreads BEAUTIFULLY and sets up just firm enough, with a wonderful fudgy texture. Paired with the yellow cake, it’s perfect for a special birthday, and a special birthday boy, whether he’s two or forty-two. I know that this cake will become a classic in our house – it’s just that good. I know my kids will go through the phase of “WHY can’t I just get the grocery store cake with the lurid purple frosting and the creepy plastic figures on it, MOM?” But I know that if I bake them cakes like this one, this will be the cake they remember. Yellow cake. Chocolate frosting. Butter and flour two 9" round cake pans and line the bottom with parchment. In the bowl of a standing mixer (or with electric beaters), cream the butter and sugar until the butter is fluffy and pale. Add the eggs, one at a time, beating after each addition, then add the vanilla and almond extracts. Beat long and hard until the batter is fluffy. Combine the flour with the soda, baking powder and salt. Add ⅓ of the flour mixture, and beat until just combined. Add half the buttermilk, beat until just combined, then ⅓ the flour mixture, beating until just combined, then the remainder of the buttermilk and finally the remainder of the flour. Divide between your two pans (I find a scale helps me to evenly divide), and bake in the middle rack of the oven for 20-25 minutes or until a tester comes out clean when you stick it in the middle of a cake. Cool in pans for 15 minutes, then on a rack until cook. The easiest way to sift cake (or any flour) is to dump a bunch in a bowl and whisk it with a balloon whisk, then measure it. You can substitute cake flour for regular flour but your cake won't be as light. If you don't have buttermilk, don't just swap in regular milk - the leavening won't be right. You can sour the cup of regular milk with 2 Tablespoons lemon juice or vinegar, though. 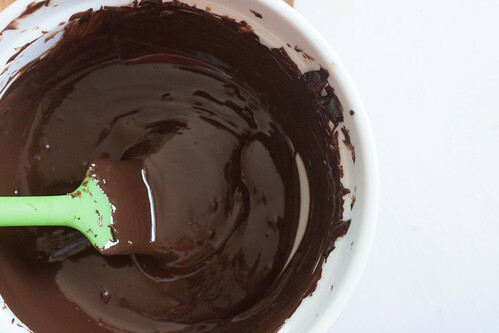 Combine the chocolate chunks in a bowl and melt in the microwave, 20 seconds at a time, stirring after each round until the chocolate is melted. Use right away to frost the cake - if you must refrigerate the frosting, let it soften before frosting the cake. When I have a yen for a “real” cake I can’t even force myself to buy a bakery cake. The crumb just isn’t the same as my mother’s from my childhood. I don’t want a puffy marshmallow texture “cake” that flattens when you go after a bite with your fork. I want an actual slightly tight yet moist square of cake with some icing in every bite. Not too much to ask, eh? Other nostalgic desserts like Italian Rum Cake are supposed to be spongy because they’re made with Genoise layers but that’s another sweet subject.